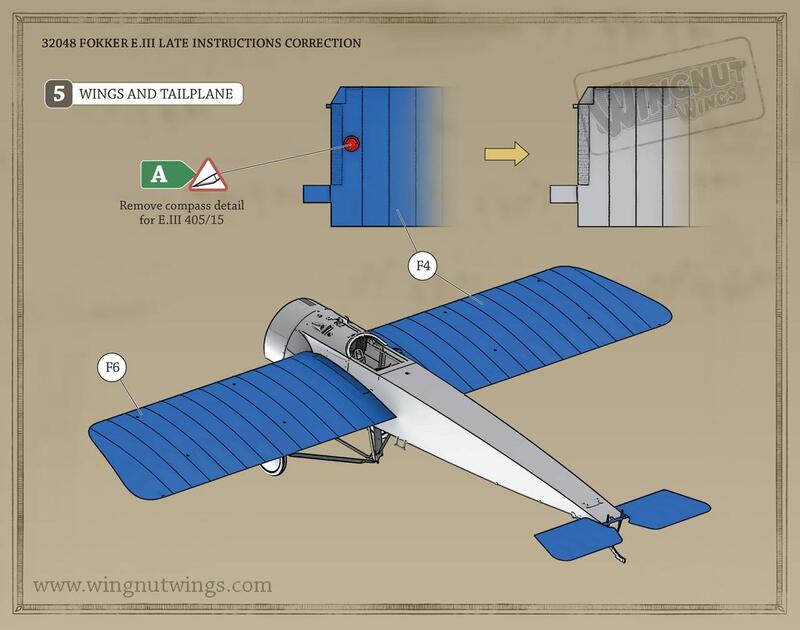 In this review I will cover the 2012 Wingnut Wings recent release, kit #32048. I would predrill all the rigging pilot holes in the fuselage halves (PP 1 & 2), wings (PP F 4 & 6). Step 2. Unites the the fuselage halves (PP A 34 & B 12) trapping the cockpit assembly from step 1. Note the various detail options depending on the profile you are building. Step 3. The motor comes in plastic (On tree "E") or there is an after market item available from Vector. The Gnome B-2 9 cylinder rotary was license built by the Oberursel company and designated as their U.I 100hp. I would replace the kit push rods and use scale thickness metal rods to the front connections of its nine cylinders and paint in aluminum plate. Originally an internal-tooth ring gear mounted on the engine drove a stationary magneto mounted on the firewall, whose high-voltage output terminal was in close proximity to the spark plug terminals as they passed by. This arrangement eliminated the need for points, distributor, high-voltage wiring and capacitors found in conventional mechanically timed ignition systems. But this was altered by Fokker (U.I 100hp) and Gnome (later B 3 & N types) when wire leads were connected to the spark plug and attached at the other end to an electrically charged ring near the fire wall. After this dries thoroughly I use a mixture of “Testors Model Master” drab earth and flat black in a wash shot through an Airbrush. This duplicates nicely the burned castor oil spray patina prevalent on rotary powered aircraft of this time period. Keep some of this mixture for later use. Step 4. Next is the undercarriage / landing gear assembly and attachment. Clean up the parts and remove any seams. They are minimal here. (PP A 25 & 30, B 3) Otherwise proceed as instructions dictate. Note the exclamation point in the instructions. This is a side view of this assembly and notes the forward rake needed. The PE replacement plate (PE 5) is a reinforced metal item that Fokker placed on the area under the muzzle of the machine gun. It is not a vent. Step 5. Wings (PP F 4 & 6) and tail plane (PP A 6). The production E.I had an 80hp Oberursel (U.0) rotary and wings of 8.95 m in length. The production E.II had the 100hp Oberursel (U.I) and wings of 9.75 m (9520mm.) The E.III had the 100hp Oberursel (U.I) with wings of 9.99 m (10030mm). This last example is what was on E.III 210/16 when it was captured. Step 6. Upper forward cowling detail. This mostly about the armament variations and the trestle (PP A 13) support for the rigging. You can choose either the German 1915 version of the Spandau Maxim lMG 08 or the Austro - Hungarian Schwarzlose M 7 / 12. The breech / receiver (PP H 10, B 11, PE 10 ) is correct as is for the profile of the Schwarzlose. Check your references. A metal tube could be substituted for the plastic machine gun barrel on PP H 10. But it would have to be slightly thicker at one end. The ammunition feed assembly is moulded to the ammunition box (PP H 1 & 2) noted in step 1. (Note historically speaking, on the first few E.I types the early model Parabellum MG.14 was employed). Steps 7 Note The fuel cap (PP A 8) was slightly to the right of center otherwise it would interfere with the internal rigging. The Germania (PP F 7) and Garuda (PP F 1) propellers are noted. Page 11 The rigging is discussed here. Possible mediums are 0.15mm monofilament or metal fishing line sheathed in clear plastic. Next shoot the castor oil mixture over the outside of the metal cowling surfaces and the adjacent pilot’s left wing. On the finest setting this should be done at an oblique angle from the propeller shaft across the wing surfaces (upper & lower.) This represents the exhaust flow due to the propeller blast. This exhaust seeped into the fabric as it trailed back over both of the (pilot’s left) wing surfaces and the corresponding fuselage areas. There was notably much less staining to the pilot’s right side of the aircraft. The older the machine the more stains. All profiles are generally accurate. A. E.III 405/15 Ltns Otto Pfälzer or Ernst Udet KEK Habsheim, March, 1916. B. E.III 608/15 Ltn. Josef Jacobs Fokkerstaffel West, May 1916. C. E.III 246/16 Ltn. Max Immelmann, KEK Douai, June 1916. E. E.III ?? ?/16 Ltn. Manfred von Richthofen, Kasta 8, June 1916. F. A.III 03.43 Flik 8 & 19, Austro - Hungarian Army 1916. Also small addenda sheet is provided. 1. ‘Althaus !’by S. Lawson, Cross & Cockade Int. Vol. 20, #1, 1989. 2. Eisernes Kreuz und Balken Kreuz by H. Nowarra, Hoffmann Pub. 1968. 3. Fokker E.III by R. Rimell, Windsock Datafile 15, Albatros Pub. Ltd.
4. Fokker Eindecker E.III by D. Jones, Cross & Cockade GB, Vol 5, #1, !974, insert Mechanical Drawings and General arrangements. 5. Fokker Fighters of WWI by A. Imrie, Vintage Warbirds #6, Arms & Armour Press, 1986. 6. Fokker Monoplanes by J.M.Bruce, Profile Pub.#38, 1965. 7. ‘Fokker Train Atterrissage’ from French Air Service 1916, via Dan San Abbott. General wing arrangements and measurements. 8. German Army Air Service in WWI by R. Rimell, Vintage Warbirds #2, Arms & Armour Press, 1987. 9. German Fighter Units 1914- May 1917 by A. Imrie, Osprey Pub. 1978. 10. ‘Kobes in FFA 11' by J. Jacobs, edited by S. Lawson Cross & Cockade Int. Vol. 27, #2, 1996. 11. ‘Kobes in Fosta West’ by J. Jacobs, edited by S. Lawson, Over the Front Vol.9, #4, 1994. 12. Lafayette Foundation, Denver Co.
13. ‘Sketches and Descriptions’ by J. Jacobs, edited by S. Lawson, Cross & Cockade Int. Vol.29, #2, 1998. 14. ‘The Flight Log of Ltn. von Hippel’ by J. von Hippel unpublished, 1914-1951. 15. 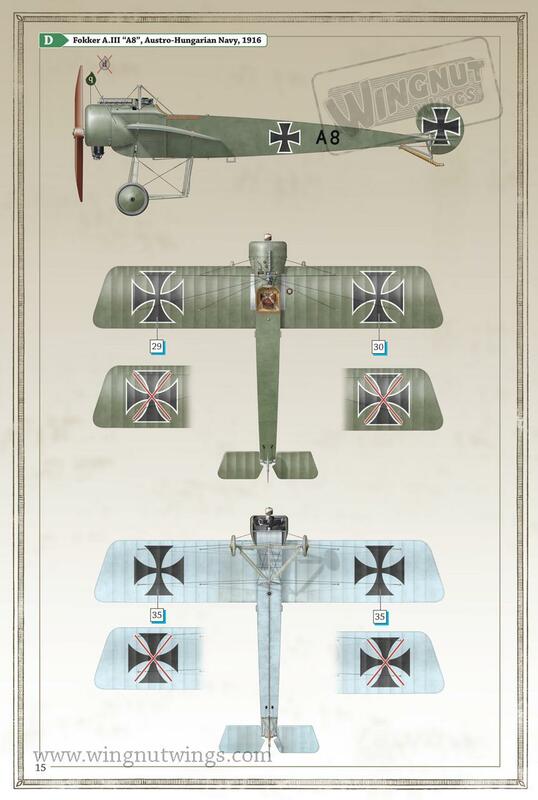 'Early German Aces of World War I' by Greg VanWyngarden, Osprey pub. AOA #73, 2006. Highs: Exceptional detail, high quality instructions and multiple decal profiles. Well researched. Lows: Vertical split in the motor halves. Don't blame you a bit Mikael. I have a Battle Axe Fokker D.VII if you want to replace your E.III. Hah! The new Windsock Fokker E type Compendiums probably have more extensive information. New or more accurate info is always possible with these old birds. News item here. Here are a couple of errata pages from WNW for this kit. For those of you with Facebook connections. KEK unit histories And here are a few Caveats from a fellow modeler. ". . .Any history here is of necessity very brief so we recommend that you seek out the references mentioned below for the better understanding of the various Fokker Eindeckers, but we do so with the following caution; considerable confusion exists about these important aircraft (in no small part because of incorrect or conflicting Idflieg and Fokker factory records). Because of this we highly recommend you treat published drawings & specifications with a great deal of skepticism. We feel that Josef Scott’s new Windsock Datafile Fokker Eindecker Compendiums published in September 2012 will go a long way towards clearing up much of this confusion. " "One thing I would recommend is perhaps revisiting some of the facts after you've been able to read through the 2 new Windsock Datafile Fokker Eindecker compendiums. Also check out Windsock International V 28 #1 2012 which tackles several of these beliefs head on. All 3 publications deal with quite a few misconceptions such as E.II powered by the 80hp engine, different wingspans between the E.II, E.III & E.IV (and even late production E.I). Although not dealt with directly, it should be noted that Fokker E 54/15 was a late production E.I (and not the E.III prototype). As an addendum to the fabric colour issue, have a look at the starboard side view photo of Fokker E.III 635/15 (from "The Duellists" - attached) where the fuselage of the 'earlier-late production' E.III in the background (from the 4XX/15 series) is clearly a lot darker than 635/15. Some will argue that they are the same colour, perhaps 'beige', but we feel it is more likely they are different colours, with 635/15 being finished in 'beige' and the other one in a darker colour, most likely 'field grey'. Anyway, the Fokker Eindecker family are a fascinating subject." While I tend to like "new" information I am sceptical too. While I do not have the "Compendiums" in my hands at the moment, I am open to these suggestions and will verify them at my earliest opportunity.